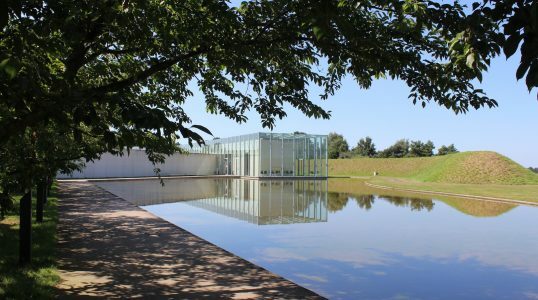 Part of the Museum Insel Hombroich in Germany, the Langen Foundation is an art museum featuring the works acquired by art collector Marianne Langen. The museum’s collection of Modern art and Japanese art is impressive; however, the architecture of the Langen Foundation is perhaps the most fascinating work of all. The building is a former NATO rocket base that was remodeled and converted into an art museum by Japanese architect Tadao Ando. As with other museums designed by Ando, such as the Modern Art Museum of Fort Worth, the architecture features his repeated use of concrete walls, steel beams, and large windows.